PAUL SIMON: STILL CRAZY AFTER ALL THESE YEARS: 1975: 5 STARS OUT OF 5 STARS: Outside of Graceland- Paul Simon’s most acclaimed album. Won Grammy for Best Album and Best Male Vocal Performance. I still remember in his Grammy winning speech his thanking Stevie Wonder for not releasing an album that year! 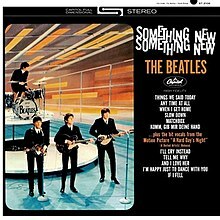 THE BEATLES: SOMETHING NEW: 1964: 5 STARS OUT OF 5 STARS: All around I prefer the UK versions of the albums but it is a nice trip back in time to give these a listen at least once a year. Listened to both the stereo and mono versions.